Ted Speirs was a gifted sculptor, well known in the local arts community. Sadly, he passed away in January, 2012. This webpage pays tribute to Ted’s creative energy and tireless commitment to the sculpting of wood and stone. Ted was well-loved and respected by friends, colleagues and collectors. His passion for life and learning resonates throughout his eloquent creations. 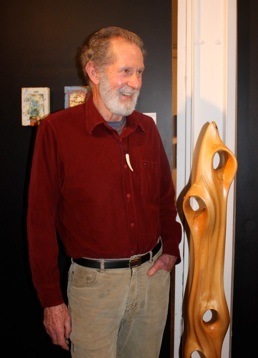 For the past 12 years, he exhibited frequently with the Vancouver Island Sculptors Guild. Ted Speirs working on Jonah’s Whale at Xchanges Gallery, 1998. Ted used his imaginative powers and technical skills to create an intriguing variety of sculptures. He celebrated the abundant energies of earth and sky with dynamic shapes and sensuous forms. Recurring themes and motifs in Ted’s work include mythological creatures, goddesses, birds and sea mammals. Photos in Title Bar: Left, Tree of Life, Yellow Cedar Root, 2008. Middle, Phoenix Studio and Gallery on Wilkinson Road. Right, Guardian Eagle, Soap Stone, 1998. In the beginning, Red Cedar, 2006. Joy of Life, Red Cedar, 1999. 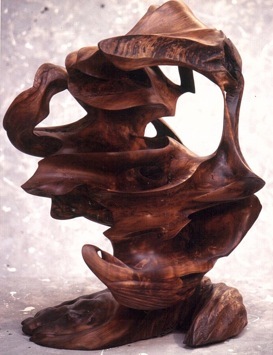 Essence of the Phoenix, Vine Maple, Marble Base, 1999. Father Sky, Mother Earth, Red Cedar, 1998. Hawk and Dove, Red Cedar, 2010. Ted Speirs, guest artist at Imagists Opening, Sculpture Studio, Nov 2011. Linda Woodbury, fellow artist and partner. Linda met Ted Speirs in 1998 at Xchanges Gallery. Both artists rented studio space and in September 1999 collaborated on a show called Focus on Spirit. encouraged me to frame and exhibit my acrylic and collage works," says Linda. During their twelve year relationship, the couple operated a home/gallery in Fairfield and participated in many studio tours, festivals and art shows. David Hunwick, friend and colleague. David Hunwick founded The Sculpture Studio in Victoria in 2008. Ted participated in several group shows at the studio and was one of David’s personal friends. David enjoyed Ted’s inquisitive mind and uplifting personality. “He was always eager to help out,” says David, “and will be much missed." David describes Ted as a dedicated professional with a genuine passion for sculpting. Using hand tools such as the adze, the gouge and Native hook knives, Ted followed his heart and let the wood reveal its inner beauty. “He worked in harmony with the materials and seemed to carve effortlessly,” says David. A Legacy Fund honours the memory of Ted Speirs. For ten years she operated an art & framing shop.